A paper entitled: Extract from the Conference given by Guillermo Kerber, at the World Council of Churches, Geneva, on 06/05/2013” was distributed for personal reading and reflection. What touches me and why ? What is the prophetic call now? After personal reflection, there was a plenary session. Creation is a gift of God and it is part of me. Harmony and balance in creation are necessary. Respect and care for the earth… incarnated prayer for creation. The old and new testament call me to the Contemplation of God to the appreciation of all the Gift God gave to me. My call is to be more connected with creation; Creation is an icon of the face of God. Then the sisters were asked to formulate some priorities in relation to creation. In the afternoon we reviewed the three days on justice and tried to come to a consensus on key words that will give direction for the future. Listen to the cry of the earth and the cry of people living in poverty. We dramatized the gospel scenes and afterward shared our reflections. 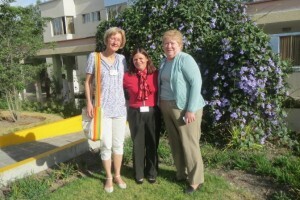 Our mission partners Elizabeth Poulain, left, Ma. 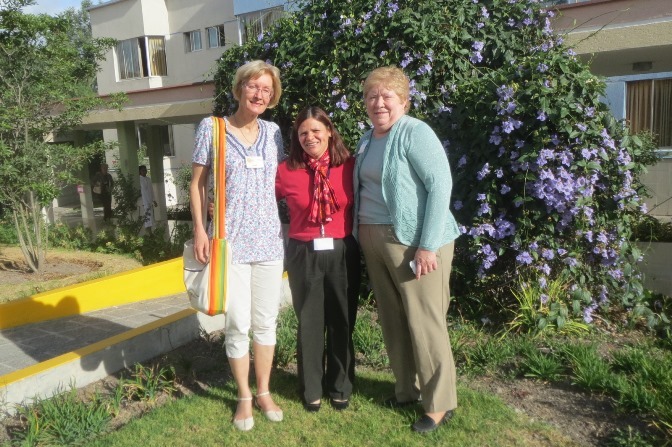 Lucrecia Loaiza and Arlene Clement shared their experience with us and we expressed our appreciation. The day finished with a word of thanks to sister Hedwig.